The stuffing recipe here, inspired of course by the Simon and Garfunkle song, was a favourite of mine for roast chickens when I first moved out of home. 1. Heat your oven to 180C. 2. Make the stuffing by removing the crusts from a loaf of bread and cutting the white bread into large cubes. Pulse in a food processor to coarse fresh bread crumbs. Fry the onions in a 50g of the butter until translucent and softened but not coloured. Remove from the heat and add the remaining butter to the hot pan, allowing it to melt. Strip the leaves of the herbs from any stems and finely shred them to produce 1 cup of shredded herbs. Into the bread crumbs mix the softened onions with melted butter, herbs, salt and a little stock or water to create a soft stuffing. 3. Rinse the turkey under running water (remove the neck if still attached) and drain well. Stuff the stuffing into both the neck and rear cavity of the bird. Truss the turkey with kitchen string; start at the neck flap, pin the wings to the body and cross the back of the bird. Loop under the parson's nose and tie the legs together at the ankles. Rub the skin of the bird with 50g of softened butter and season well with salt. 4. Split the carrots in half lengthways (you don't need to peel them) and cut the onion into chunks. 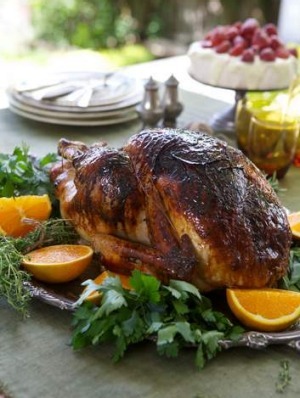 Place the carrot and onion on the base of a roasting pan and place the turkey on top of the vegetables. Cover the pan with foil and roast in the oven for 2 hours, basting every half hour with the juices collecting in the pan. After 2 hours, uncover the pan and roast for a further hour, until the skin of the bird is browned. 5. While the turkey is roasting, mix together the ingredients for the hot orange glaze in a small saucepan and simmer for 30 minutes until thick and glossy. After the turkey has been roasting for a total of 3 hours, begin to brush with the glaze every 15 minutes for an additional 45 minutes. 6. Remove the turkey from the oven and cover loosely with foil. Rest for 30 minutes in a draught-free place, continuing to brush the turkey with hot glaze every 15 minutes, even while resting. 7. Remove the turkey from the pan and drain off and reserve any pan juices. There should not be too much oil in the pan but if there is a lot then you may want to skim some of the oil. Place the pan over heat on the stove and scatter 2 tbsp of plain flour over the pan and vegetables. Scrape the bottom of the pan and add in the white wine to deglaze, roughly mashing the vegetables. Return the pan juices to the pan and stir until thickened. Strain the gravy and serve with the turkey.